According to Dan Clowes, each issue of this "digest-size" publication was 96 pages long, and reprinted 3 stories. Rick Norwood reported the existence of the third, but were there more? If you know of other issues or if you're willing to donate the third Barnaby Quarterly, let me know. Thanks. Reprints the first three episodes of Barnaby (1943): "Mr. O'Malley Arrives," "Mr. O'Malley's Malady," and "The Doctor's Analysis" (pp. 1-91 in Barnaby). The inside front cover includes the photograph from Current Biography 1943 and a short biographical sketch credited to H.B. The back cover features an article titled "Critical Acclaim." 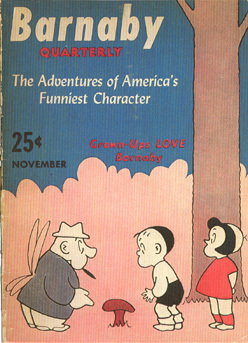 In addition to some of the comments found on the Crockett Johnson Homepage's "Critics" page, the brief anonymous essay proclaims that "NOT SINCE Gilbert Seldes made his elaborate analysis of Krazy Kat in 'The Seven Lively Arts' back in the '20s has a comic strip received so much attention from the adult intelligent citizen as has BARNABY." To provide a sense of "reader reaction," the piece describes what happened at the Baltimore Sun: "After giving BARNABY a short run, that paper decided to discontinue publication. They were forthwith flooded with hundreds of letters and petitions demanding its immediate return. The chastened editors capitulated and restored BARNABY with a front-page story!" Reprints most of the following episodes from Barnaby (1943): "Pop vs. Mr. O'Malley," "The Invisible McSnoyd," "The Pot of Gold" (pp. 72-85, 114-137, 144-175). Also reprints these episodes in their entirety: "The Big Broadcast," "The New Neighbors," "Pop Is Given a Dog" (pp. 178-249). The inside front cover includes a history of comics, titled "The Comics in America." 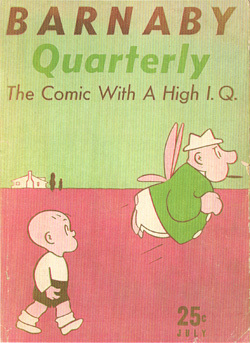 It begins, "GROWING LIKE TOPSY without form and direction since its first appearance at the end of the last century, the comic has, however, in unmistakable fashion, reflected the social climate of our country." This one-page unsigned essay goes on to argue that, to provide relief from the Great Depression, the comics of the 1930s relied upon "action, suspense and narrative" instead of the "humor" of earlier comics. When war came in the '40s, the "comic characters joined in the battle." 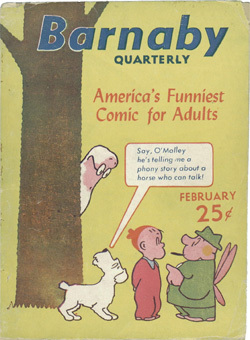 "Barnaby," the article maintains, appeared in response to "a demand for the return of humor to the now-misnamed 'comics.'" The piece concludes, "Breaking sharply with the strip conventions and frankly pitching its key to the literate, Crockett Johnson has shown in Barnaby the limitless possibilities for wit and wisdom which America's favorite literary form possesses."